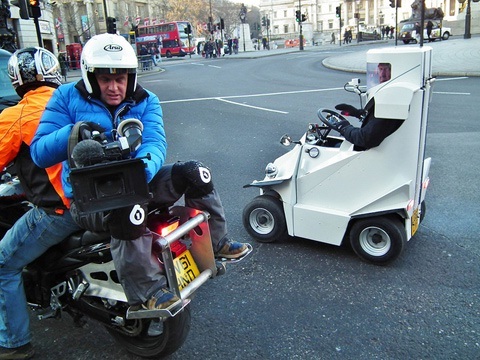 Jeremy Clarkson’s P45: innovative or just plain ridiculous? Home › News and Reviews › Jeremy Clarkson’s P45: innovative or just plain ridiculous? Before anything else, let’s start with a disclaimer. Jeremy Clarkson, Richard Hammond, and James May are notorious for doing crazy, ridiculous, and sometimes downright bizarre things. From switching off the air conditioning in Richard Hammond’s car on a very hot Indian day to a driving test in the BBC headquarters with the Peel P50, these hosts are always up to something…interesting. It should come as no surprise, then, that at the beginning of this year Jeremy Clarkson announced his latest invention: the P45. Designed in response to the Peel P50 that Clarkson (uncomfortably) drove in Top Gear’s 2008 season, the P45 is a hybrid microcar that featured in the first episode of their latest series. The P45 is very, very, very, very small car. With a design based on a quad bike, the P45 seats just one person and clocks in at a top speed of a whopping 30mph. Its fuel tank holds just 1.7L of fuel; however, this can be swapped for an electric motor for (slightly prolonged) driving time. Although it is, technically, a hybrid microcar, the vehicle’s design is somewhat distanced from the traditional design of Mitsubishi cars or Hyundai cars, and more reminiscent of a golf cart or a beach buggy. How did Jeremy Clarkson fare in his driving showcase of the P45? It wasn’t the smoothest ride, that’s for sure. He encountered a few hiccups along the way, has some trouble steering and driving at the speed limit, and bumps his head multiple times on his makeshift helmet. The car also whirrs and sputters and struggles to stay quiet. Why would anyone want such a thing? While it may seem ridiculous, the P45 does have some advantages. Its compact design means it fits through tight alleyways and packed traffic, and the concept is perfect for a busy and congested city such as Sydney or London. The P45 is also (somewhat) economical, with the option to swap in an electric motor. Also, the car is definitely unique and will get you attention (although the type of attention you receive cannot be guaranteed). Described by Hammond and May as “utterly ridiculous” and “a complete death trap”, the P45 leaves a lot to be desired when it comes to safety. There are no air bags and the driver’s arms are completely exposed, leaving them open to a myriad of hazards and risks, much like a motorcycle driver. The car’s lack of speed also creates some risk for vehicles behind it as well – a top speed of 30mph is bound to cause unexpected congestion, after all. In the end, while Clarkson’s attempt at a microcar is extremely entertaining to watch (and somewhat noble), the only location you can find this car right now is in the World of Top Gear exhibition in the Beaulieu National Motor Museum in the UK. Love it or hate it – what do you think about the P45?